Tile Tester 1 is a test level from the Catacomb Abyss, residing in slot 20. It has no official name, but the MAPSABS.H file in the source code refers to it as 'TILE_TESTER_1_MAP'. It appears to be designed for testing the wall textures. This level is not accessible via the orginal DOS game executable. However, it is playable in the CatacombGL source port, via the level warp cheat. The layout of the level can also be viewed in the Wolf3D Data Compiler. Tile Tester 1 consists of a single, large room, containing 28 columns with various wall textures. Some walls have a door texture, which upon use will take the player to The Towne Cemetery. 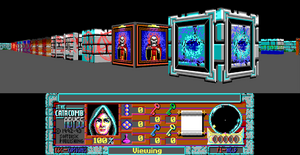 Also present in the level is the archway as seen in the final room of The Passage to the Surface. Going through the archway takes the player to the victory screen. There is no LEVEL21TEXT entry in the EGAGRAPH.ABS file, hence there are no messages defined for this level.